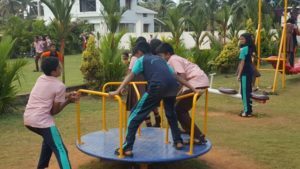 The most awaited day of the year , the class picnic for class 7 was organised on November 3rd ,2018 to” Aaryan resort ‘’ ,Santhekatte , Udupi. A group of 107 students were accompanied by 7 staff members. Students and teachers gathered in the school campus for a short prayer. Principal Rev Fr. Robert D’souza addressed the students on discipline and after seeking God’s blessings we started our journey around 7.45 a.m . Children were excited and they sang melodiously all the way to the picnic spot. We reached the resort around 9.25 a.m after having sumptuous breakfast ,children enjoyed playing by splashing, swimming and dancing in the water with great enthusiasm. Later in the afternoon we relished the lunch provided with different varieties of dishes. Desserts were also served. Once again ,some students continued to play in the pool and some in the park. Around 3 o’clock juice and snacks were served and we started way back to school. We reached safely around 5 o’clock in the evening. After the final prayers children dispersed carrying memories of the day out with a big smile on their face. We thank our Principal Rev.Fr .Robert D’souza for giving us an opportunity and organising such a wonderful and entertaining day out where children could relax and have fun.